Chris Waller is concerned about second-up syndrome with Chaussure but the trainer cannot help but be delighted with his return from almost two years on the sidelines. Chaussure came within a half length of winning over 7 f at Randwick two weeks ago but had to settle for fourth. His jockey Tommy Berry was so sure he should have won, he fired in a protest against Adnrew Adkins on first-placed Gitan but to no avail. With Berry riding Pierata in Saturday's VRC Sprint at Flemington, Tye Angland takes over on Chaussure at Rosehill in a similar race on Saturday when he will again meet Gitan and Man Of Peace, second in the Randwick race. Chaussure's time off was because of a cut on a leg which failed to heal as it should have. 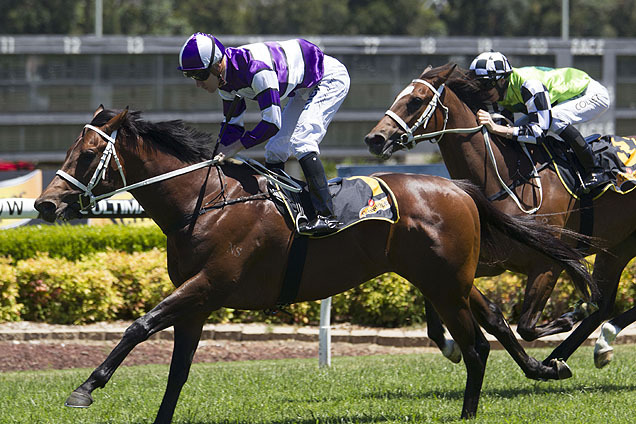 "It was a very good first up run after a long break," Waller said. "I always get a little concerned about being a little flat second-up but he certainly has class this horse. "It was great to see him attack the line as well he did first-up. Barrier eleven is a little concern but with a good strong rider in Tye Angland aboard he will sum up the situation at the 4 f mark and work out where he needs to be to give this horse every possible chance." Chaussure is raced by Woppitt Bloodstock headed by Winx's co-owner Debbie Kepitis. Among Chaussure's rivals are his stablemates So You Win and Ombudsman. "So You Win is returning after a long break but he certainly showed us promise last preparation and the extra time certainly won't have done him any harm," Waller said. "Ombudsman is a stayer resuming and did a good job last preparation when winning a few Sydney races and I expect him to go to a higher level this preparation. "Obviously it is a bit short but I am sure he will be attacking the line well over the concluding stages. So You Win is raced by another of Winx's three owners, Peter Tighe', and wears his Magic Bloodstock colours sported by the champion.